Your Guide to places to eat and drink in Corbridge. For such a small town there really is an excellent choice of cuisine and a wide range of places to eat. Below you will find highlights of some of our preferred places. A full list, along with web links (where available) is provided towards the bottom of the page. 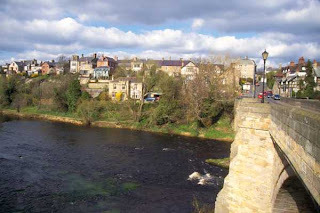 I have also included the areas surrounding Corbridge as there are some places that are just too good to be missed! If you eat at any of these places be sure to mention where you heard about them! Our featured places to eat are all marked on our interactive map of Corbridge or Buy a full guide of where to Eat and Drink in Northumberland. I believe that the Corbridge Larder is something special that should be celebrated. The Delicatessen is unlike any other shop that you'll come across, they stand for quality and value above all else and have done for over twenty years. Their products are extensive and of the finest quality: over 100 types of cheese, 80 types of jam, marmalade and honey, home-made pies, quiches and tarts, Italian antipasto, Greek meze and fine cheese from their award winning cheese shop. Their coffee shop only serves what they sell, which is a statement of pure confidence in what their produce, and rightly so. You simply can't visit Corbridge without popping in to the Corbridge Larder, even if it's just for a coffee and to marvel at the range of produce. This wonderful restaurant is based in a very attractive stone building and from the moment you walk through the door you're in for a treat. Artisam is known locally for their warm welcome, friendly staff and excellent Chinese food. Food can be ordered from the main menu, or as with most Chinese restaurants you can opt for a set price banquet style meal. The banquet does provide better value for money and is reasonably priced given the quality of the food served. Portions are generous, so you'll need to come with an empty stomach and a strong appetite! I would recommend booking in advance if you are planning on eating here at the weekend, they also offer a handy takeaway service. The Black Bull is a very popular and attractive pub with plenty of character, with the building dating back to 1755. Inside the restaurant is really quite charming with it's beamed ceilings and coal fire roaring in winter when it's freezing outside. It's honest pub grub here and there's absolutely nothing wrong with that when it's done well. The bar area has a lively atmosphere with a good choice of ales and the restaurant is known for it's friendly service and good honest food. Corbridge has a good range of cuisine and Il Piccolo as the name would suggest is the town's Italian restaurant. The food is good value and typical of what you would expect to find in your local Italian restaurant. Staff are friendly and the atmosphere is lively, although service can be a little slow when things get busy. This can be forgiven when the food is up to scratch and it certainly is here. The small Village of Newton is a few miles to the East of Corbridge and is definitely worth visiting for the Duke of Wellington Inn. They have more of a fine dining approach to their food than your typical pub and this is reflected in the awards that the restaurant has won. All food is prepared with fresh, seasonal ingredients to create a traditional British menu. The Sunday lunch is particularly fine and should be experienced if you are staying in the Corbridge area. The Duke of Wellington also has the enviable position of offering beautiful views over the Tyne Valley. Food is served seven days a week, visit their website for a menu and more information. Vallum Farm is also just a few miles North-East of Corbridge and is a haven for icecream and food lovers. It's set in a beautiful country location that would be difficult to beat and has a tea room that serves delicious home-cooked food and an icecream parlour. Particularly popular in the Summer months, the icecream parlour has a huge range to choose from including their award winning chocolate brownie flavour. There is an outdoor play area for the kids to burn off some energy, lovely country walks and pick your own seasonal vegetables.